I’ve written two novels ‘ A Jarful of Moondreams’ is out now, ‘The Barn of Buried Dreams’ is released in October and I’m part way through my third. Can you see they have a thread running through them? That thread is part of the tapestry of our lives. You see, my novels are about the struggle and determination that we need to follow our dreams. We have cherished dreams from childhood and yet more get added when we discover what it is that we yearn to do with our lives. We are great dreamers but we have to turn into doers too! My childhood dream was to own a dog like Lassie or Rin Tin Tin. I was also an avid reader and thought that Dodie Smith had the best job in the world. Maybe, some day, I could be a writer with a houseful of pets? When I eventually got my first pup, in my mid-twenties, she was named after a character in my favourite Dodie Smith novel. I know what you may be thinking, but no, she wasn’t called Pongo or Perdita! Cassie’s name came from ‘I Capture the Castle’. She was my wonder dog. It took a lot longer to call myself a writer and I’m still working on the ‘successful’ part of the writing dream. I think following our dreams gives us a zest for living and achieving them is icing on the cake. Hold on to the icing on the cake comparison because it will reappear! Last month, we travelled to France and spent a week with Pauline and Allan. Pauline loves to grow her own fruit and veg, she loves to cook and sewing gives her real pleasure. How can she possibly be related to me? Pauline and Allan moved to St. Estephé in France last year and now she is growing strawberries to make jam, picking cherries to make cherry brandy and brushing up on her French. She has a sewing room for making her patchworks. Allan has a workshop in the barn to refurbish furniture and a ride on lawn mower to tame their acres of land. They have both worked hard throughout their lives, faced tragedies and experienced set backs but they have never given up on their joy of living. Doesn’t it take courage to sell up in England and start life in a new community to follow your dreams? They took the plunge, and I have never seen this pair looking happier. Another exciting trip was to support my youngest sister who is working to make her business dream come true. Urban Cakehouse -unique, contemporary, unconventional cakes -started up in her kitchen and she is getting it up and running while working and running a household including three teens, a husband and a dog. Lisa has a PhD and works within the NHS but has always loved to be creative. Her dreams of being an artist have veered more towards cake and this is where the icing on the cake comes into play. I was so proud to be at her ‘Cake meets Canvas’ exhibition at the Fly tower in Sheffield. Dreaming is easy but putting a dream into action is damned hard work. Both Pauline and Lisa have to put in the hours and make sacrifices to do what they love while considering their families. It does not always go smoothly and it is risky to follow a dream but they think it is worth it and so do I.
I don’t dig the soil, sew the cushions or bake the cakes; their dreams are my nightmare! I just lounge back on the cushions, eat the cake and listen to the chatter and use it at times to draft the stories of women struggling through day to day challenges and doing their best to make their own cherished dreams come true. 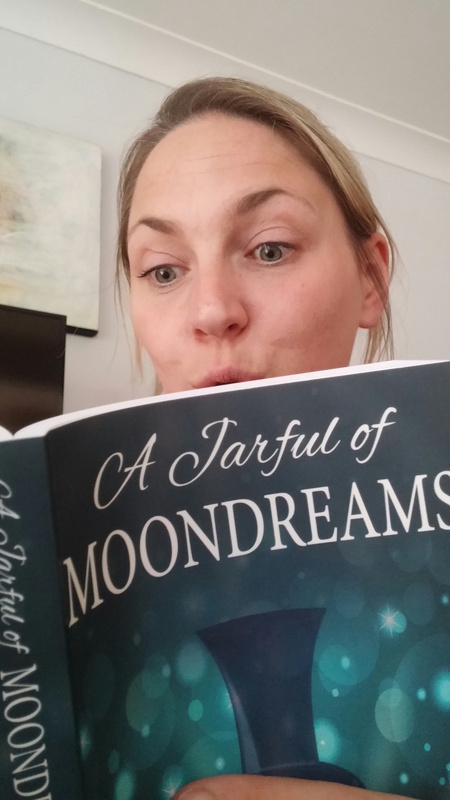 ‘A Jarful of Moondreams‘ is about romance and family relationships. Cleo and Alex are sisters and it’s complicated. They infuriate one another but they both want what’s best for Teri, their mother. Can they fall in with Teri’s plans and survive a whole summer together! Somebody liked my writing. I don’t know my ROMANTIC NOVELIST’S ASSOCIATION reader but I’m very thankful for their support and advice. This arrived in December and I’m taking the advice on board and then getting my novel out to people. Here is my plan for 2016. I’m going to look for a brilliant agent and a two book publishing deal. I’m going to finish book number two in the Dunbridge series and send it out to publishers and agents. When I’ve got book one published, I’m going to take it to local libraries and radio stations and talk about it and read parts of it and encourage more readers to try my writing. I’m really excited about 2016 !